Read this book review to learn about this investing book. This book review will walk you through Warren Buffett and the Interpretation of Financial Statements, so you can decide if this is the right financial book for you. And guess what? In this book review I’ll not only tell you what I liked and disliked about this book. I’ll also answer the other burning questions you have, like who is Mary Buffett? And does this book accurately represent the Warren Buffett approach to value investing. Hopefully my perspective will prove helpful for you. I’ve read plenty of Warren Buffett books and have studied Buffett’s investment strategies in-depth. So I feel qualified to give you a clear answer as to whether Warren Buffett and the Interpretation of Financial Statements is the right book for you. 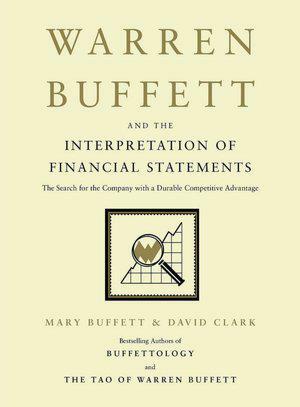 Warren Buffett and the Interpretation of Financial Statements was a great book. I was actually surprised how good it was. I wasn’t even going to buy this book, but I really needed something quick in a pinch. I’m glad I picked it up. The main reason why I liked Warren Buffett and the Interpretation of Financial Statements so much is because it’s exactly what it sounds like. The book has one or two quick introductory chapters about Warren Buffett and his overall investment approach. And then from there, it just gets down to business. The book dedicates each chapter to a line on each financial statement. It then methodically goes through the income statements, balance sheet and cash-flow statement. And of course, the chapters don’t just talk about the financial line items. They discuss how Warren Buffett would interpret each particular. Warren Buffett and the Interpretation of Financial Statements is so focused on helping you understand the facts that it lays out an actionable roadmap you can follow to interpret financial statements in a Warren-Buffett-Like manner. But wait, I know what you’re thinking? When people write about “what Warren Buffett would do” I’m always skeptical. I mean, why are they writing books if they know how to get so rich, right? But in this case, I was reassured. Mary Buffett is the former daughter-in-law of Warren Buffett. She was married to his son for 11 years, and presumably has spent some time around the Buffett household. David Clark, the other author is a practicing “Buffettologist” living in Omaha. He studies Warren Buffett and runs an investment fund. So it seems the authors of this book are more than just passing Warren Buffett fans. But other than that, there’s one other thing about the book I want to warn you out. While Warren Buffett and the Interpretation of Financial Statements is a great book to help you improve your value investing, it’s not perfect. The book is only about 170 pages long. And the pages are pretty small. So while the book moves quickly, it’s also necessarily a little simple. I think I got more out of this book because I’ve read so many other essays, letters and books by and about Warren Buffett. While you can definitely read this book early in your investment career, I think you’ll get more out of it if you focus on some of the fundamentals first. Warren Buffett and the Interpretation of Financial Statements is a great book. But my favourite part is they give specific measures and metrics for you to use as a yardstick when evaluating financial statements for yourself. Whether it’s a balance sheet, cash flow or income statement, this book gives you specific benchmarks to keep in mind when you’re evaluating your own stock ideas. What more could you ask for? I think the one thing that would make Warren Buffett and the Interpretation of Financial Statements an even better book was if it contained a summary table with all of the stats and figures they mention. I’m seriously contemplating making one. Warren Buffett and the Interpretation of Financial Statements is a great investing book that I recommend to value investors of all shapes and sizes. It’s a good refresher on the fundamental best practices of financial analysis. And it’s really easy to understand. For those reasons alone I recommend you buy Warren Buffett and the Interpretation of Financial Statements on Amazon. If you’re looking for a little more information, check out the video book review of Warren Buffett and the Interpretation of Financial Statements below. This entry was posted in Stock Ideas and tagged investment book reviews, Warren Buffett and the Interpretation of Financial Statements on August 19, 2014 by Jworthy.